The Island House, a Mackinac Island hotel, is a State of Michigan Historic Landmark that sits within the boundaries of the Mackinac Island State Park, 1,700 acres of natural resources. From our veranda, discover for yourself why this extraordinary island beckons visitors world-wide. Island House overlooks Lake Huron and the Mackinac Island harbor. 93 guest rooms and three 2-bedroom suites are each unique. Meeting facilities, on-site dining, live entertainment and Internet access are all part of The Island House. 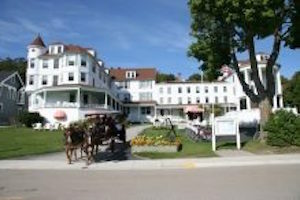 The Island House is located near Mackinac Island restaurants and shopping, Mackinac Island ferries, bike rentals and Mackinac Island historic attractions.